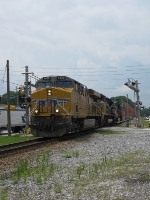 Description: Headed across the Kaw River is UP Train KOAMN 29. It'll be in Missouri in about 30 seconds. Description: The DPU on the stack train. Description: After making a meet in Saint Louis, Missouri the MASPR-26 takes off (unrealizing the lights were off) however with my awknowledgement lights were restored as freshly painted UP 7430 blares past Livingston, IL in-route to Proviso Yard Chicago IL. Description: The differnce in age is apparent on these two GE units. Description: A meet near Maricopa, NS in the mix.